Confessions of a Fabric Addict: 12 Days of Christmas in July Blog Hop and Quilt-Along - The Beginning! 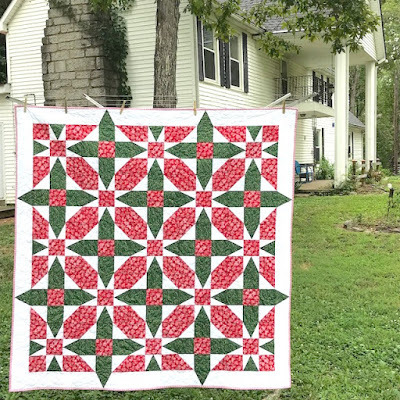 12 Days of Christmas in July Blog Hop and Quilt-Along - The Beginning! Welcome to this year's 12 Days of Christmas in July Blog Hop! We have twenty-eight great bloggers all lined up to give you some fabulous crafty ideas with which to bring in the season - and all in July, so you have time to pick and choose (and finish!) your favorite projects! Each day, here on the blog, I'll be directing you to that day's bloggers AND providing a calendar of all the blogs participating. And that's not all that will be here on the blog - as in the past years, I'll be doing a tutorial for a quilt top that can be finished in about an hour a day over the twelve days of the hop. There will even be a couple of catch-up days, too, in case you get behind. And this year, I've shown some alternate color ways of the quilt, so if you don't want a Christmas quilt, you can see the potential of other color combinations. And best of all? I've got a few giveaways to do during the hop, and so are some of our bloggers. So don't miss a day - you might miss out on a flash giveaway! So let's get started!! First, I'll introduce you to today's bloggers. First of all, we have Joy from Days Filled With Joy. You might remember that she was a guest blogger for the Hands2Help Challenge this year, sharing what it's like to live and quilt in the Middle East. She's going to share some great gift ideas with us and I for one can't wait to see them! Our second blogger is Selina, who blogs at Selina Quilts. It seems like I've known Selina forever - I think hers was one of the first blogs I ever followed - and I love her style! She's going to share a scrappy Christmas tumbler quilt with us today, and I know you'll love it! And FYI - here's your first giveaway alert: one of today's bloggers is having a giveaway! So check them out and join in the fun! And here's this year's quilt-along quilt! After much pondering on names, and a lot of help from my friends, I think we'll call this one "Rejoice"! You can see some other color ways on this post, too, including one that would be appropriate for Quilts of Valor. This quilt, as shown, finishes up at approximately 68" x 68". The colors in each top are arranged in the same sequence, so if you prefer one of the other colorations, or one of your own, just choose your fabrics accordingly! It will also be helpful to have a Tri-Recs ruler and a 6.5" Bloc-Loc ruler. You can find more information about those on the post referenced earlier showing the different color ways. There's also a discount code for the Bloc-Loc ruler that is good through 7/15/18. If you don't have, or don't want to buy a Tri-Recs ruler, I can send you a PDF with the correct size templates drawn on it. NOTE: Be SURE to give me your email address in your comment! If you don't, I may not be able to send it to you, as Blogger sends many comments as "no reply". Set aside your leftover material to cut borders later! Don't lose it! And that's it for Day 1! Not too much, I hope. Tomorrow we'll start making the parts for Block A. See you then! Oh, and here's a list of all of the bloggers who will be participating in the blog hop - because I know you all want to know! Don't miss a day - it's going to be awesome! And don't forget those flash giveaways - you never know what day there'll be one (I don't even know!) so check in daily! Thanks for the tutorial! I really like how the point fall over into the border. Great idea! Super design for your quilt along! Thanks for hosting this annual hop to get us all started on ideas for the holidays with enough time to get them finished!! Looking forward to the quilt along! I have the tri rec rulers but mine are by Marti Michell. I have had them for years but have never used them! Thanks for the opportunity!!! Would you please send me the templates so I can verify the size? My email is djtaylor999@hotmail.com. Thank you! And we're off! Thanks for the fun! Such a pretty quilt and I happen to have a stash of leftover Christmas fabrics I was just going to give away. Now I'm debating making this quilt...like I need another project... But I'm missing how large the quilt finishes? I'm sure it's somewhere, but I can't seem to find it in any recent posts about the quilt along...help! Thanks! Sarah, this year of the 12 days is off to a wonderful start. Another fantastic pair of bloggers giving us more wonderful projects to sew now or save for later. Sharon, you are a no-reply blogger and did not provide your email address, so I am unable to send you the templates. Please email me directly at salliesue57 (at) gmail (dot) com and I'll be glad to send it to you! Love your quilt, Sarah! I've been looking forward to your blog hop all summer and it is finally here! My goal is to comment on every participants blog...so many good ones to read. please send me the template pdf. Thank for the QAL, can't wait to get started! Please send pdf for the templates also. I cut all my scrappy pieces for the QAL, and blogged about it, too, woo hoo! It took me 2-3 hours, and I wondered why that was so much longer than it took you. Then I realized that cutting from just three fabrics would go much faster than sorting through my scraps and trimming all the odd sizes into a cohesive pile. And of course, now I have a new set of scraps from cutting the scraps...it never ends! I’m pretty tempted to try this QAL even though I have a very poor track record for keeping up and finishing them. I won a tri recs ruler set last year and have never used it. This might be a good time to give it a try! Here's to a successful blog hop. Make-A-List Monday - Back on Track! Can I Get A Whoop Whoop? How I Got My Mojo Back! Make-A-List Monday - A Little Change of Pace! Can I Get A Whoop Whoop? Elephants on Parade! Make-A-List Monday - July? JULY! !